I am a guy with too much free time. But that's okay, because I can use this free time to contribute to KDE! My main job is bug triaging (currently in the top 5 as visible here), and sometimes I also write patches. xyquadrat added a comment to T10827: Website redesign. Should KPhotoAlbum enter this discussion? xyquadrat updated the task description for T10827: Website redesign. xyquadrat added a comment to T10318: Refresh the Kile website . My idea is to host it under kile.kde.org eventually, but for that I'll need to talk with Sysadmin and set everything up. Right now I simply created a demo hosted on my own server because that was easier and I would not have wasted the precious resources of our sysadmins if in the end the site is not wanted. Thanks, but Kile's website is just fine under https://kile.sourceforge.io/. You are welcome to propose a new style but it shouldn't be the same as for *.kde.org. I totally agree that it'd be great to update most of these websites to a unified design similar to the one used in kontact.kde.org. That would require us to create a boilerplate-style repository where all the CSS and JS lives. The HTML is probably very site-dependent, but we should still try to reduce maintenance as much as possible and to unify parts that are common in multiple sites. xyquadrat added a comment to T10636: Announcement text for the Applications 19.04 release. The release announcement is currently only translated into 5 languages, whereas 18.12 was translated into 10. I don't know much about our translation process - can anyone provide further insight on why this might have been the case? xyquadrat added a comment to T10812: KDE Applications. What about an hybrid versioning system for the apps? Perhaps something like "Okular 1.6.3, distributed with KDE Applications 18.12.3", something that remarks that Okular has an individual release cycle, but this version comes from KDE Applications 18.12.3 bundle. xyquadrat updated subscribers of T10636: Announcement text for the Applications 19.04 release. I do plan to make a release video; will start working on it this weekend so that it should be finished by April 17 or earlier. xyquadrat added a comment to D9117: Add shortcuts for copying screenshots to clipboard. What is the status of this patch? @rkflx is not around any more, but maybe someone else can take this review? xyquadrat added a comment to T10477: Matrix launch. Friendly ping to @mludwig, do you have any objections? xyquadrat added a comment to T9142: Update userbase.kde.org and remove outdated information . You are amazing, thanks for your hard work! I'll see if I can help out this weekend. Thanks @trickyricky26, I would never have noticed that. Fixed. This is a test notification, sent at Sun, Jan 13, 16:24.
xyquadrat created T10318: Refresh the Kile website . xyquadrat added a comment to T10131: Announcement text for the Applications 18.12 release. xyquadrat added a member for KDE Promo: xyquadrat. @jriddell I think it would be great if we could use the modern theme for this, what needs to be done to make this happen? It would make it visually consistent with the Plasma release announcements (which already use the new theme) and works much better on mobile than the current theme. xyquadrat updated the task description for T9122: Promoting KDE as a brand through KDE apps. xyquadrat updated subscribers of T9122: Promoting KDE as a brand through KDE apps. 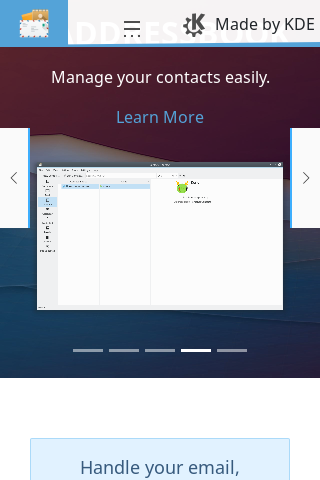 Regarding Digikam: I am not sure where on their website (https://digikam.org) to put a "Made by KDE"... Maybe to the left of the "Download" button? I think it'd also be great if we could somehow have a presence in the application, as Digikam is one of the projects that is often used standalone, without any other KDE software (similar to Krita). According to the git history, @cgilles is probably the most active Digikam developer, so we should discuss this with him. xyquadrat closed T9794: KDE Plasma 5.14 Release Video as Resolved. 5.14 has been released and while we didn't have an official video, there was a nice number of other videos that also showed off the new features. Let's wait and see if 5.15 brings something more exciting to the table. xyquadrat added a comment to D16395: Update the "About KDE" text. KDE is a cooperative enterprise in which no single entity controls the efforts or efforts or products of KDE to the exclusion of others. xyquadrat requested review of D16354: Remove all textual references to Babe. xyquadrat added a comment to T7888: Where to report bugs?. As the GitHub repository is now officially unmaintained and the source has moved to Phabricator, it would be a good idea to open up a new product on bugs.kde.org so that users can report bugs. You'll probably need to contact Sysadmin for this. xyquadrat abandoned D16153: Update content for 2018. Abandoning revision as @araceletorres already updated the content until the end of 2017.
xyquadrat added a comment to D16153: Update content for 2018. Linking to outside sites is fine, it's the hotlinking to images that i'd rather avoid. People's personal blogs have been known to go down in the past when their post hit Planet due to the images from that post being embedded on Planet and thus generating quite a bit of load on their blog server. One thing i'm curious about: why are you removing the Facebook/Twitter infrastructural points? Surely those could be used in the future? xyquadrat updated the diff for D16153: Update content for 2018.
xyquadrat requested review of D16153: Update content for 2018.
xyquadrat is attending E475: Bugsquad Bug Day - Konsole. xyquadrat is attending E476: Bugsquad Bug Day - Konsole. It's great to hear that you've already been updating screenshots on userbase @ognarb ! I am currently on vacation, so I won't be able to help you until next week. +1 for your proposal, we really need a more clearly defined structure for the application pages. I also experienced some problems when updating screenshots, this might be related to the fact that userbase currently needs to be based upon an older version of MediaWiki. If the problem persists we should ask the Sysadmin team if they could take a look. xyquadrat updated the task description for T5782: [Planning] Marketing goals. xyquadrat added a comment to T5782: [Planning] Marketing goals. xyquadrat added a comment to T9622: Plasma 5.14 Release Announcement. Are we going to have a release video for 5.14? They are always a great way to make people aware of the new feature/fixes, but it obviously take quite a lot of time to produce one. xyquadrat added a comment to D15751: Center content & banner. xyquadrat updated the summary of D15751: Center content & banner. xyquadrat requested review of D15751: Center content & banner. xyquadrat added a comment to T9691: Decide on 2018 products. xyquadrat added a comment to T9690: Decide on Bug Day occurance. xyquadrat added a comment to T8469: Build a curated list of Twitter feeds from interesting KDE contributors and users. As mentioned in this official post by Twitter, the current feeds are broken since September 10th. This means that it'd be great if we could go ahead with the implementation of this task such that we have a working widget on the Planet again. Is there anything that is currently unclear/needs to be done? xyquadrat is attending E470: Bugsquad Bug Day - Kickoff with Krita! - Part 1.
xyquadrat added a member for Bugsquad: xyquadrat. xyquadrat added a comment to T9299: Kontact webpage feedback. xyquadrat added a comment to T9243: Help the KDE PIM team with content for the new Kontact website. xyquadrat added a comment to T8747: Putting KDE's videos to the alternative video platform PeerTube. This task is a bit stuck in the pipeline. I think we can generally all agree that it'd be a good idea to host our videos on a public Peertube instance, as Peertube better reflects our values and priorities. Now, https://nsa.ovh has recently encountered a total data loss according to their Twitter account, so I don't think they'll be a viable option in the near future. Currently https://peertube.mastodon.host sounds like the best option to me (high data cap that we can surely ask to be upgraded if needed, 1080p video and the admin(s) seems to have quite a lot of experience). A good start would be if we could upload the Akademy videos there, as they are mainly thought for a specific audience and not for the general public to randomly stumble into. When will the videos be ready & who manages them? xyquadrat added a comment to T6832: Improvements to Bugzilla - Making it easier and simpler. xyquadrat added a comment to D15104: Add "Made by KDE" logo. I do not have commit access, so unless somebody has any objections to this change I'd be glad if you could land it for me. Thanks! xyquadrat updated the summary of D15104: Add "Made by KDE" logo. xyquadrat requested review of D15104: Add "Made by KDE" logo. xyquadrat added a comment to T9250: Revive bug triaging days. xyquadrat added a comment to D14674: handle non-ASCII encodings of file names in tar archives. Also, there are already a few unit tests in this repo that you could take a look at. xyquadrat added a comment to T9273: Announcement text for the Applications 18.08 release. They are most likely far from publication-ready (I've never written release notes before), but hopefully can serve as a start for the announcement text (which, according to the proposed schedule, should be done by tomorrow). Okay, I'm really sorry for my late announcement: We are going to do a bug triaging day tomorrow, Sunday the 5th. @ngraham and @nicolasfella have already mentioned that they'll participate, but if anybody else would like to join in, please do so! I'll be online on the #kde-bugs channel for most of my day (so from ~9:00 UTC till 19:00 UTC). xyquadrat added a comment to T9122: Promoting KDE as a brand through KDE apps. Three suggestions on where you could put it, but I am generally not good in design so others should probably figure out the details. Sorry that I've gone quiet for a while, this task somehow disappeared from my mind... According to the commits to the Falkon site, @drosca is in charge of the web part of Falkon, so we should ask him to get involved into this effort. xyquadrat closed T9270: Give Julian Schraner moderation rights as Resolved. xyquadrat added a comment to T9270: Give Julian Schraner moderation rights. Gwenview's bugs are already fairly well triaged these days. I would recommend going through the old kio bugs. I think this will yield more fruit since there's lot of crusty stuff in there that's already been fixed over the years or is no longer relevant, and the work will have a real benefit since it will bring us closer to being able to have 0 bugs in kio with everything in the new frameworks-kio and kio-extras components instead. At that point, we can go through those bugs. KIO is super important since it underpins the operation of many KDE apps and features. Thanks for the initiative, Julian. 9 bugs were valid bugs or wishes. In need of patches, and more often than not further refinement of the idea to make them a good fit for Gwenview required. 7 bugs needed further investigation how Gwenview is working today in that situation or the reporter has a weird local setup. Good fit for triaging. 4 bugs contained a request which might seem valid (often wanting to add stuff), but does not fit the current vision of Gwenview (of not adding everything, since it is different from DigiKam). Would need someone to say no, but not someone to post "awesome idea" resulting in disappointment when a patch gets turned down later. This query results in 397 bugs found. It's probably counterproductive to flood Gwenview's small team with requests relating to advice for bugs fitting case #3 (it often takes quite some thinking to figure out if those wishes are something we want or not). Would it make sense to compile a list of bugs belonging to case #2, which are a better fit for triaging? xyquadrat updated subscribers of T9250: Revive bug triaging days. xyquadrat created T9250: Revive bug triaging days. xyquadrat updated the task description for T8258: Promo subgroups. How should we go forward about this? Which projects should be contacted next, and who is going to contact whom? xyquadrat updated subscribers of D13971: Formatting torrent ratio as floating point number - no scientific notation. Looks good to me, but I think you forgot to specify any reviewers. There isn't an official KTorrent project here on Phabricator, but you could probably add some developers who have contributed to KTorrent in the past few months (@dvratil maybe?). Maybe include KDE Promo for now? There may be a more appropriate, group, though. What team set up userbase originally? xyquadrat updated subscribers of T9142: Update userbase.kde.org and remove outdated information . I updated the https://userbase.kde.org/What_is_KDE a bit, it should now be more friendly towards non-Linux users and I've replaced a few old images. Who will contact which project to see how we can get this effort up and running? Nice. We should probably include updating userbase in general in the web re-design discussion and make it a proper task in its own right. I have the feeling that there is room for a lot of corrections and improvements, right? xyquadrat created T9142: Update userbase.kde.org and remove outdated information . xyquadrat added a comment to D13861: Improved Welcome Screen. I've updated the https://userbase.kde.org/What_is_KDE page a bit, it should now be less hostile towards Windows/Mac OS users but please improve the page further if you do find any issues. Looks great! As discussed in T9122, it'd be good if we could place the KDE icon & something like "A KDE project" in this welcome screen. I'd either propose the area below "Drag Image in window to open" or above the "Start" title. But if you do have another idea (or don't want to add this), that is also totally fine. Maybe I am just adding more questions but. Is software development rising or falling in general? Where are developers going if they aren't going to KDE? Things like github are nice, but they don't offer nearly the amount of resources that something like KDE does. I am not European, but open source is a very big thing right now in the USA and it dominates a lot of industries such as the internet. Krita is also currently updating their welcome screen over in D13861, we could suggest that they add a small monochrome KDE logo in a corner or something similar. I just fixed a few grammatical issue (bear in mind that I am not a native speaker so it could easily still contain some errors), but apart from that I think this sounds very reasonable. KDE is much more than just the Plasma desktop or Krita and we should not be afraid to present us as one of the biggest open source software projects in existence. xyquadrat added a comment to T8871: Systematic KCM reorganisation. Maybe we could combine the content from the kscreenlocker and SDDM KCMs into a new "Lock & Login screen" KCM? Then the KWallet KCM could be a top-level KCM under Personalization or be combined with something else. One thing I'd really like to do away with is the current inconsistent two-level organizational hierarchy, where some items at the top level take you straight to a KCM, while others take you to another level of navigation where several KCMs are displayed in a little list. xyquadrat updated the task description for T8552: Polish Open/Save dialogs. xyquadrat added a reviewer for D13213: Add possibility to sort by descending order: Gwenview. I think you forgot to specify reviewers, so I added them for you. xyquadrat added a reviewer for D12983: (icon view) Text width relative to icon size: Dolphin. xyquadrat added a comment to D11022: Resize the "normal" folder icons. Yeah, pretty much ;) Nah, real life has been busy and I think that it'll take at least another two weeks until I can pick this up again. Frankly, I don't even really know what to implement now... Assuming that we do not want to WONTFIX the bug, we need to shrink the preview size down. @sharvey suggested that we set this to about 85% of the panel size, but this would not resolve the enormous icons if the panel is very wide. Should we introduce a cap (such as two times Size::Enormous)? xyquadrat added a comment to D12558: Don't filter out duplicated entries from places panel. Well, do we still need this code now? Are there any users which have not completed the transition yet? If yes, then we should try to find a way to still avoid these duplicates while preventing this crash. xyquadrat added a comment to T8554: Compile list of questions for marketing research company. Have you heard of KDE or specific KDE applications before? xyquadrat added a comment to D12321: Hide file preview when icon is too small. Fabulous. I agree with @rkflx that before committing this, we should also prepare a similar patch for Dolphin to unify the behaviors. +1 for asking institutions (especially in education). KDE has some great educational apps (GCompris, KStars, KGeography...) and there are even special distributions designed for schools (e.g. the "lernstick", a german project that is pretty much Debian with tons of edu-apps added in). xyquadrat added a comment to T8428: Update release notes for Dolphin 18.04 release. We can take some screenshots from your blog posts, but the question is how many screenshots are necessary/useful. I think that having three might be a good number, one for the "Empty Trash" button, one for the dockable Terminal plus either sorting by "Date Photographed" or the git integration. Thoughts? xyquadrat accepted D12119: Fix untranslated places panel entries. Even though I wasn't able to reproduce the bug itself (probably because of some leftover old files), this patch is really needed as it'd be very bad if suddenly all places entries were displayed untranslated in 18.04. The patch itself seems reasonable (not a lot of changes -> not a lot to complain about), so +1 from me. xyquadrat added a comment to T8473: Dolphin 'Find' button behavior. Okay, so the functionality we are discussing is already implemented with D10246, but this patch suffers from the same problem. The patch does not apply cleanly for me, so I wasn't able to fiddle around with it. But theoretically, if we could resolve the remaining problem (Ctrl + F also closes the search box), we could simply use D10246 and the wish from bug 353227 would be fulfilled.